Historian Catherine Corless, who spent four years researching the running of the Bon Secours home and concluded that 796 children had died there over almost four decades, said the Commission’s finding vindicated her work. The finding of the Commission of Investigation of Mother and Baby Homes of “significant” human remains at the site of the former Bon Secours home in Tuam has been greeted with shock. Researcher and historian Catherine Corless, who spent four years researching the running of the Bon Secours home and concluded in a 2012 article that 796 children had died there over almost four decades, said the Commission’s finding vindicated her work. “This is only the start. The truth has been revealed,” she said on Friday. The Mother and Baby Homes Commission of Investigation said excavations had uncovered “significant quantities” of foetal remains, as well as those of children aged up to three years. In a statement on Friday, the Commission spokesperson said the remains were found in “at least 17 of the 20 underground chambers which were examined earlier this year”. The spokesperson for the Commission, which is chaired by Judge Yvonne Murphy, said it was “shocked” at the discovery. The Bon Secours Sisters said they were “fully committed” to the work of the commission. The Order underlined that all records relating to the home were handed over to Galway County Council when the home closed in 1961. They said they therefore couldn’t make any further comment on the Commission’s announcement. The Mother and Baby Homes Commission of Investigation is investigating how unmarried mothers and their babies were treated between 1922 and 1998 at 18 institutions within Ireland, most of which were run by religious orders. Responding to the Commission’s finding on Friday, women who spent time in some of the homes as recently as the 1990s called for two other sites where children are believed to have been buried to be investigated and for clarity on the number of children involved. Historian Catherine Corless based the figure of 796 on death certificates held in the Tuam home’s archives. The number of infant deaths is not disputed. It is representative of the extraordinarily high mortality rates in mother and baby homes in Ireland in the first four decades of the twentieth century. According to historian Dr Conor Mulvagh, who has studied the papers in the Dublin Diocesan Archives, the figures nationally for infant deaths were at their peak in the 1930s. In Sean Ross Abbey home, the death rate peaked at 42 per cent in 1942, when 73 out of 170 children born there died; elsewhere Bessborough’s death rate reached 50 per cent, with the death of 53 out of the 106 children born there in 1942. Documents from the 1930s and 1940s show concern being expressed within the government and at local authority level about the extent of infant mortality in these institutions. “Tuam did not happen in a vacuum,” Dr Lindsey Earner-Byrne, author of Mother and Child: Maternity and Child Welfare in Ireland, 1920s–1960s, has observed. She believes the characterisation of unmarried mothers as moral outcasts in the first decades of 20th century Ireland was not just a Catholic consensus, but part of the overall social consensus of the time, as the Protestant Bethany Mother and Child home in Dublin demonstrates. When the information began to emerge about Tuam in 2014, Archbishop Diarmuid Martin of Dublin called for an examination of “the whole culture of mother and baby homes”. 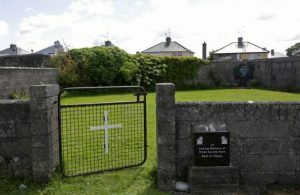 The burial site is now a grassy patch on the edge of a housing estate in Tuam, enclosed by a gate with a large white cross. Beneath this grass area, a septic tank is believed to be located where the skeletal remains of infants lie, as discovered by two children playing in 1975. But locals had suggested that it may also house the remains of people who died during Ireland’s famine years (1845–49). According to historian Catherine Corless’ research, there were no burial records for the children from the mother and baby home and they were not interred in any of the local public cemeteries. The children, aged between two days and nine years, may have died from malnutrition, measles, convulsions, TB, gastroenteritis and pneumonia. They were not buried in a coffin but were simply wrapped in a plain shroud. Historian Conor Mulvagh believes that an inquiry must look at the treatment of children in life but also their treatment in death. In 2014 the Irish bishops issued a statement welcoming the announcement by the government of a Commission of Investigation into Mother and Baby Homes. They said it was disturbing that the residents of these homes suffered disproportionately high levels of mortality and malnutrition, disease and destitution. “Sadly we are being reminded of a time when unmarried mothers were often judged, stigmatised and rejected by society, including the Church.